I learned to fish for bonito and false albacore from the ferry pier in Oak Bluffs. The regulars who taught me were David Duarte, Arthur Winters, Harold Hill, Kevin Hall, Wayne Coutinho, and a man named Howard, who worked at the Boston House. Most of those characters have passed on now. 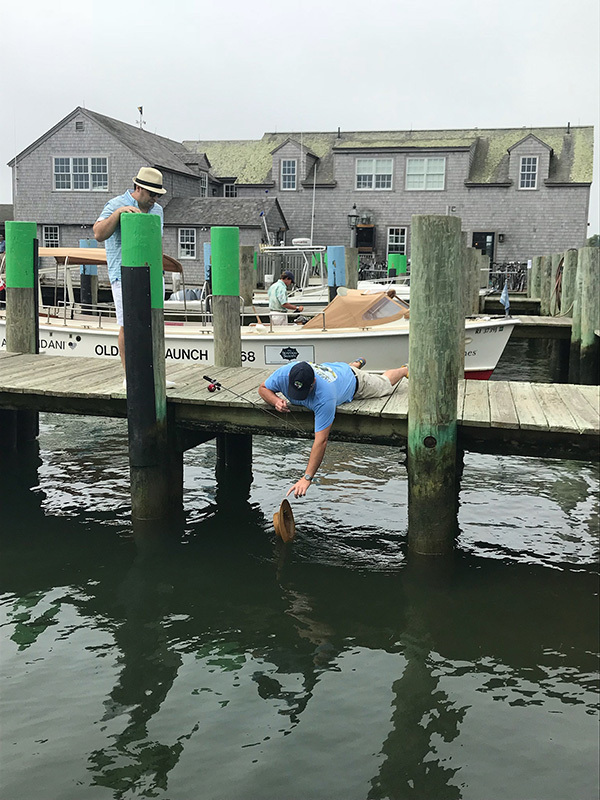 When they banned us from fishing from the pier in the early 1980s, I began to fish from Memorial Dock in Edgartown. 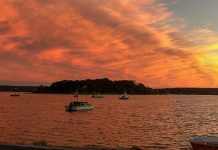 Stalking striped bass at night can be a solitary and secretive adventure, but chasing bonito and false albacore, what we call “funny fish,” puts me in the open and in the daylight with dozens of other fishermen. While fishing from the piers, docks, and jetties, I’ve met many interesting fishermen. I’ve watched kids catch their first scup and then watched them fish into adulthood. Some have made it onto the stage to receive major awards during the Derby ceremony. I’ve known Michael O’Rourke from the time he was in daycare. He has grown into a productive member of our Vineyard community, serving as a Tisbury police officer. He still fishes when he gets a chance, and I always enjoy when we stand side by side, fishing and chatting on Memorial Wharf waiting for a false albacore to take our bait. It’s been a privilege to know many families that fish the shore together. Paul and Debbie Brewer raised their boy Luke sitting on the wharf. Luke still fishes. Mark Saur had his boy Timmy with him, and Timmy, now a man, still fishes. 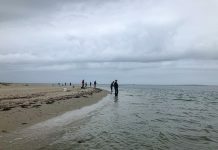 I fished many times on the beach with the entire Jerome family — Ed, his wife Maryanne, his dad Joe, and their boys, Joseph and Nick, when they were children. It was a heartwarming time. Sandy and Lori Fisher have fished the wharf for generations. They always had one of their five kids, and later some of their five grandchildren fishing the wharf with them. I’ve shared smiles of joy and tears of sadness with these families. Sissy Tankard and I were close friends in the ’60s. We lost touch for a few decades, but now we have been reunited because of our love of fishing. When she’s visiting her family on the Vineyard from her home in Boston, Sissy has become one of the gang. She is passing down her fishing techniques to her granddaughter, fishing for scup and butterfish from the wharf. Recently I’ve come to know Nik Scott and his son Jake. They are a father-and-son team that have been fishing together for more than 10 years, since Jake was 4. Since Jake doesn’t have a driver’s license, Nik’s wife of 30 years, Pauline, stands by to take Jake fishing when he is unavailable. 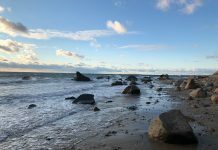 His 22-year-old daughter, Madeline, pops in on the wharf occasionally, but enjoys fishing more when she joins them for bass fishing on the beach. Nik says she usually catches the largest fish. Under his hoodie, Jake quietly exudes intensity as he concentrates on getting his bait or casting his lure into the harbor. He’s always polite when he asks to borrow a net to land an albi for one of the other fishermen. 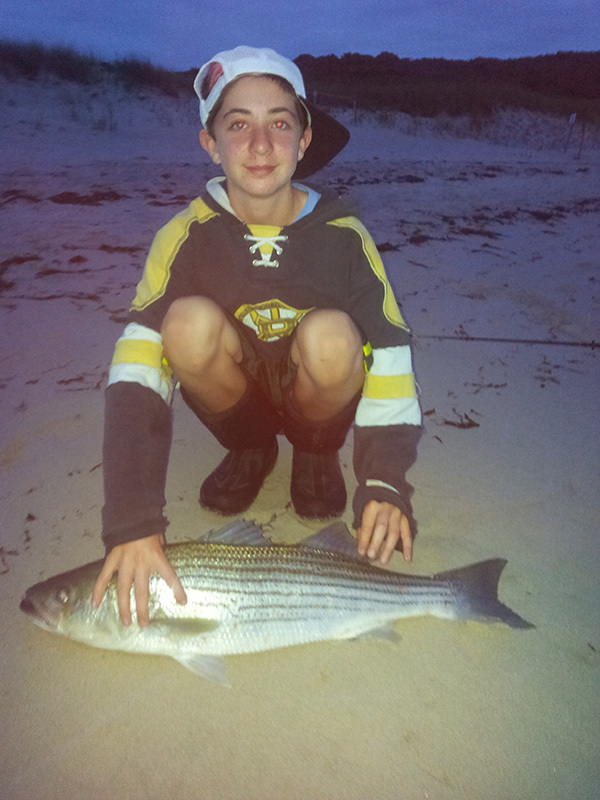 Before and after school and on the weekends, somewhere on the Vineyard, if he’s not playing hockey, Jake is fishing. Not just during the Derby, although Nik and Jake are serious contenders, but throughout the season, spring until late fall. Nik works in construction, and Jake, 14, got his first job this summer as mate with Captain Chip Vanderhoop on Chip’s boat Quickpick. Jake was on stage receiving awards for the 2017 Derby. 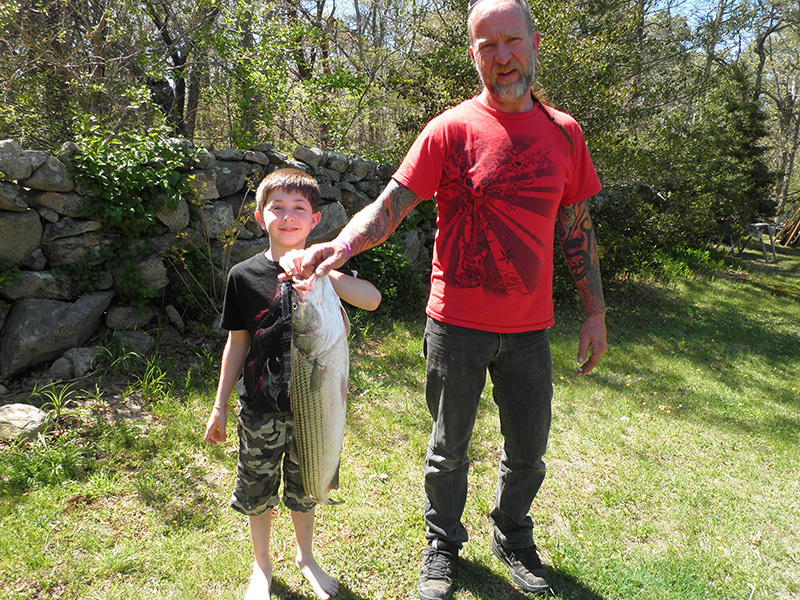 He finished in first place in Junior Shore striped bass, and second place in Junior Shore albi. I ran into Lil Larry’s, and after some finagling, Joel Cristy, who works the counter, was able to tie a rig onto a small rod with a Zebco reel that he just finished fixing. He asked me to mind the shop while he ran out to help a woman in distress. Success. Alysse Llerna, visiting from Miami, was smiling and happy. Although it was full of saltwater, she was thrilled to have her special hat returned to her. The harbors are finally filled up with bait, and schoolie bass are crashing through the pods of silversides everywhere I go. Still only rumors of bonito being landed from shore. September is right around the corner, so it is time to get your rods, line, and rusty hooks in tiptop shape. I would advise not waiting for the last minute to take care of this, as the tackle shops get busy during the Derby.